Epilepsy is a common chronic brain disorder that strikes over 2% of the world population. It is caused by excessive brain activity clinically characterized as seizures, which are abnormal and uncontrolled discharges of electrical signals in the brain cells called neurons. About 40% of epilepsy is associated with genetic mutations and occurs as early as infancy. The cause for the rest of epilepsy, including adult onset epilepsy, is unclear. Furthermore, drug-resistant seizures have severe consequences including cognitive decline, high mortality rate, and brain damage caused by surgical resection of seizure foci. 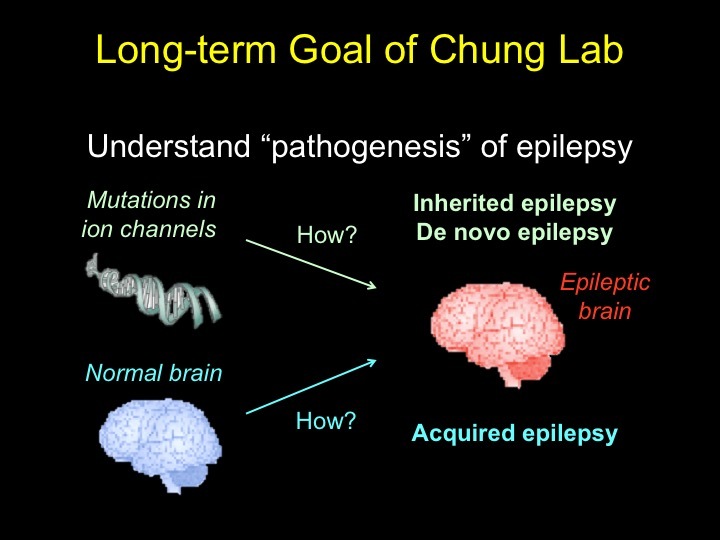 Hence, better understanding of the pathogenesis of epilepsy is critical to develop novel therapeutic interventions and early diagnostics for epilepsy. The clue comes from the fact that inherited and de novo epilepsy is associated with mutations in ion channels, which are pore-forming proteins that generate electric current by mediating the flow of ions across the plasma membrane. They regulate electrical signals in morphologically and functionally distinct neuronal compartments: axons and dendrites. Axons deliver electrical signals to other neurons by action potentials whereas dendrites receive them at inter-cellular junctions called synapses. Ion channels enriched in axons are important for action potential initiation and termination, whereas ion channels enriched at synapses such as glutamate receptors are important for communication between neurons. Since ion channels are critical regulators of neuronal activity, the major long-term goals of Chung lab research have been to (1) understand how epilepsy mutations affect ion channel function and lead to neuronal hyperactivity in inherited or de novo epilepsy, and (2) identify molecular mechanisms that persistently alter ion channel function to cause hyperactivity during the development of acquired epilepsy. To achieve these goals, Chung lab employs interdisciplinary approaches including primary neuronal culture, microscopy, biochemistry, electrophysiology and transgenic mice. Read more about our research in the IHSI blog post (https://blogs.illinois.edu/view/6761/717903).